The heat has gotten to me. All I want to do is eat salad and not very much of it. At this rate, I should be the size of Kate Moss in about a decade or so. But of course, this is good old Blighty and the rain will come soon enough and I'll still be overweight. I'd planned to do a Thomasina Miers Chicken Salad recipe for tea tonight but when push came to shove, I didn't have the energy to get the recipe book out. Yep, I'm that lazy. So as I was busy assembling a chopped green salad, a baked chicken breast, my favourite lime and balsamic dressing and reheating some of last week's lovely olive and sun-dried tomato foccacia I realised that I'd still didn't have a new recipe to try today. I quickly Googled nectarines and marscapone because I've had a tub of marscapone sat in the fridge for ages and it's nearing its sell by date; and of course nectarines left over from last night's dinner. Didn't get much back that was quick and easy and would serve just two people (plenty of gorgeous looking fruit tarts though). Then I clocked the bottle of balsamic sitting on the worktop and wondered if it would work with nectarines. Nectarines hiding under strawberries and marscapone! 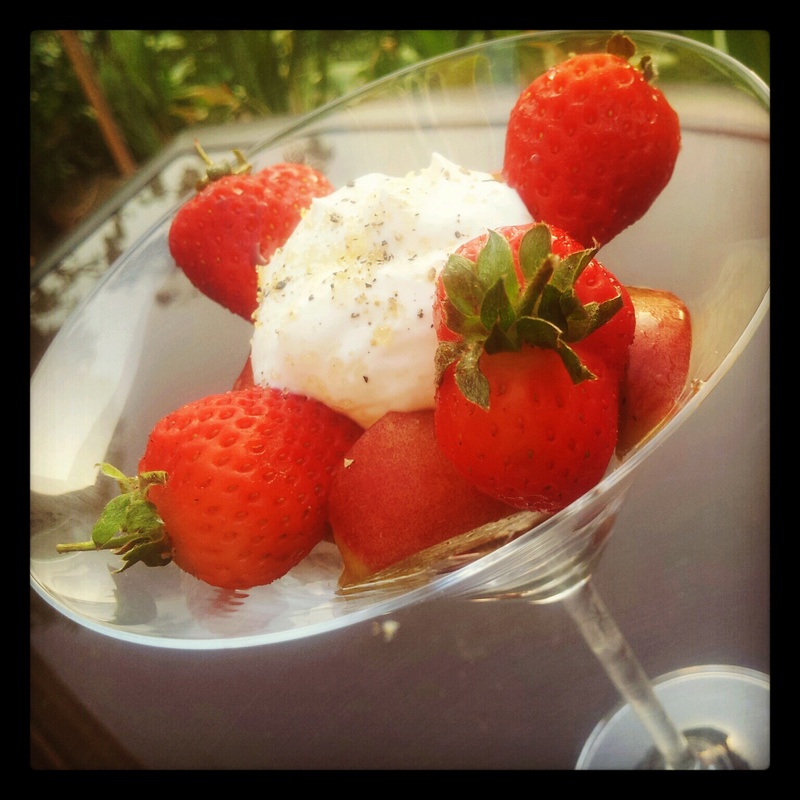 From past research, I knew that strawberries and balsamic vinegar is a popular flavour combination. My mum once made strawberry and balsamic ice cream. I normally hate strawberry ice cream as it's a bit wishy-washy but it was honestly the best strawberry ice cream ever. In fact, I'd pick it over chocolate or caramel if I had a choice. A quick change of search and yes - the two flavour combos go together. I found a really simple recipe on the Food Network website for peaches with balsamic and black pepper. This was quickly adapted to include strawberries - only really because my I had white nectarines and they just look a bit insipid on their own. Using the recommended quantities, I switched off my phone and set about making up my own version of the recipe, topped with some lime marscapone. It's a great, last minute summery pud and I loved the balsamic syrup so much that I will definitely use this taste combo again. The picture isn't brilliant as I put the nectarines in the bottom of the glass. I'd also recommend halving the strawberries as I think they'd probably pick up the flavour a little more on the cut side - I left mine whole. Place the fruit in a small mixing bowl. Combine the vinegar, pepper and sugar and then mix gently with the fruit. Refrigerate for twenty minutes. Meanwhile, beat the marscapone and yogurt together until smooth. Stir in the juice and zest of the lime and the sugar. Divide the fruit between serving glasses and drizzle with any spare vinegar mixture from the bottom of the mixing bowl. Top with a generous spoonful of the marscapone and sprinkle with demerara. Serve immediately.